Alexander, William, Jacob, Cochrans of Pennsylvania into Ohio. Was the Captain Alexander Cochran of the American Revolution my ancestor? Uncertainty about Hugh Cochran of 1700s Maryland but he also named a son Alexander. Yet they may all connect to Clan Cochran of Europe. My Alexander and William were the only two Cochran families in Guernsey Ohio in 1800 and 1810, then their sons began their own legacy of Cochran. Family tale is that two went into Canada and never returned. Some settled in Iowa Territory for many years, then California, Kansas and Arizona, with descendants in Colorado and Alabama. Jacob, the son of William, and grandson of Alexander, married Clora Jane Miller and had our Frank Delbert Cochran. Frank married Luella Coonfield and had my father Frankie Lavern Cochran in 1927. Luella's parents were Lattie Little and Ben Coonfield. In 1913 Arkansas a nice blend of genealogy began with the marriage of Frank and Luella, and once again in 1951 with Frank and Anne. Anne Carter's parents were Alice McClain and Cecil Carter. Anne was orphaned at age 4 and raised by the parents of Alice, Lorena Emma Bozeman and Charles Allen McClain in Ramer. 1972 with the marriage of Charles and Kathy, the surnames in the family tree doubled, and their daughter's marriage with Westbrook increases the number of Grandparents to baby "Carter". Carter has a strong ancestry, full of faith and patriotism, honest, hard working individuals who have created a loving legacy for him to continue. Death Certificate has errors. Parents of our grandpa were Elizabeth Broadway and Josiah Marion McClain. Parker (36 KB) Clora Jane's mother was a Parker. son of Josiah and named his first son Josiah Marion McClain. James first married Anna, maybe an indian, and he was found in Alabama 1860 census with a second wife, and they went back to Georgia after the Civil War, where they are buried in Indian Creek Cemetery. Civil War, he was Cherokee by blood and his description was dark complected, black eyes and black hair. John's mother was Catherine Weatherford, a daughter of Charles Weatherford. Anne Carter's great great great great grandfather Mordecai Bozeman was paid for his service in the Militia of the South Carolina's Continental Line of the American Revolution. He was born 1735 Bladen North Carolina and had sons, Peter, John, James. Peter moved to Alabama in 1827. Anne Carter's great great great great grandfather Mordecai Bozeman was paid for his service in the Militia of the South Carolina's Continental Line of the American Revolution. He was born 1735 Bladen North Carolina and had sons, Peter, John, James. Peter moved to Alabama in 1827. Peter had William Henry and then Henry had Peter Edward. Peter Edward Bozeman had John Thomas, and he had Lorena. Velma and her sister Dorline Gray Teegardin worked on the family tree, along with help from cousin Martha Hawes in Arizona. Velma and Dorline were daughters of Amy Coonfield, sister to our granny Luella Coonfield Cochran, so the kids grew up together and they sent me pictures of my daddy Frankie Cochran and some research notes. Montgomery - their son Jace married Aunt Ethel Bozeman. Rebecca was sister to granny Elizabeth who had Charlie McClain in 1886. Grandpa Carter son of Anna Lou Stone/Wm Franklin Fenn/adopted by Carter or biological son of Carter - Anna married 3 times that we found. Anna had 6 kids with Fenn in 7 years and left him taking Cecil with her. Annie Stone Fenn's son William Jr. Various Links to my other pages. Dr Hiram Lucius Little, son of Jonas, grandson of George Hiram was Lattie Little Coonfields grandfather. John Little Military Discharge, Civil War black hair and black eyes. Grandpa Thomas R Carter in the Civil War to Charlie Brooks. Cooks Creek Presbyterian Cemetery - Section 3 burial of Reverend Alexander Miller, the great great grandfather of Clora Jane Miller Cochran. Luella Coonfield Cochran and it was full of handwritten notes and a list of family birthdays. My daddy's sister now has this Bible, Aunt Irma Cochran. Emma Lorena Bozeman McClain kept several notations in her Bible; her marriage to Charles Allen McClain, showing who their parents were and names of their children. Lattie may have written this list, the handwriting is much prettier than other notes in the Bible. However there is a possibility that her parents wrote it down for her when she was a child...we will never know. Did this granny write in Lattie's Bible that Luella received? This Cherokee family wants to learn more about their heritage. daughter of John Thomas Bozeman and Alice Lorena Stephens of Ramer, Alabama - Lorena was the mother of Alice McClain Carter. My grandson is made up of all of genes. My Census records saved from my own subscription for future reference. My subscribed Family Tree on ancestry. Murder of Wesley Little Hiram's brother would be Luella's great Uncle. parents are A Broadway and Susan. Elizabeth is born 1853 Alabama and married Josiah McClain about 1868. Frankie was honest, hard working and faithful, grew up on a farm, some education until he joined the Air Force. Baptised in a creek in Chetopa Kansas and read his Bible every day. His word was law and his friends knew that he always had a place at the dinner table for them or an extra chair by the fish pond. He served in Korea as a copilot of a bomber plane and was wounded and sent back to Maxwell AFB in Alabama where he then told his brother Freelon that it was too hot for him to go there and Freelon went to Korea anyway and died in a truck incident. Several in my family have had special gifts, the gift of knowing and seeing, the gift of healing or the ability to stop bleeding. Dad had several true premonitions and the night before he passed away, he held me in his arms saying I love you more than you will ever know and he was gone on that Christmas morning. His sister Irma was born with a veil over her face. His aunt heard ticking in the wall before a loved one died. His granny Clora smoked a pipe and could read the ashes. He witnessed many healings by my mom's granny and he was very close to her. Most made their own medicines. He spoke of his mother spending hours in the field gathering herbs. He found peace at the fish pond, that is where he could be found on the weekends and I feel now that he is at peace with his elders and loved ones while guiding me along this journey of love. the back of photo states.. Walas Koonfield 1897 Hansard's Studio Bentonville, Ark. His name was Freelon Lorraine Cochran and his mother's maiden name is on that tombstone for some strange reason and the military documents on NARA list the fatalities of the Korean War with his name spelled wrong also. Frankie had told him not to go after he was wounded over there. 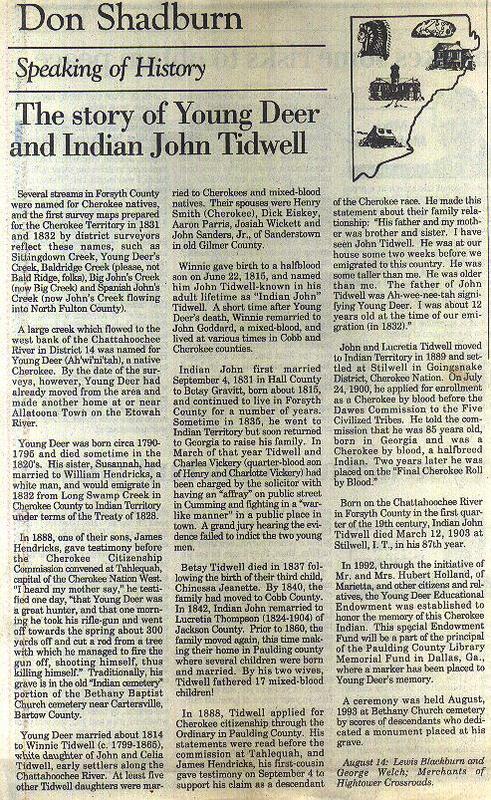 Obituary of the mother of Frank Delbert Cochran. She was the second wife of Jacob Benjamin Cochran who moved from Iowa to Hill City Kansas. Clora's parents were Mary Clara Parker and James Madison Miller. Family Photo - old Pop used to put coffee, milk and sugar in our baby bottles. Frankie Lavern is the son in front in those overalls who grew up and married Anne Carter. taken about 1951 in Montgomery Alabama. The day they met on Dexter Avenue, he told her that she would be his wife. He often talked about those sweaters :).....He called her his 5'2" indian squaw. grandpa to Anne Carter Cochran talked of seeing the spirits. His parents were Elizabeth Broadway and Josiah Marion McClain - Josiah's mother was only known as Anna and very little known about her. Josiah served in the Civil War and his son Charles served in WWI. The sons of Charles were all very dark natured. Frank married Anne Carter and they moved to Tulsa Oklahoma by 1953. Uncle Joe was an indian and a lovable man, so dark he was told to sit in the back of the bus. Frank Cochran loved his visits and his stories. 1954 they were in Mesa Arizona next to Frankie's sister Eunice, and she named her son Frankie. A tree house full of relatives. her parents were Mary Handley and Alexander Douglass of Pennsylvania. Notes on both Frankie and Anne's ancestry. Post on the Blog ! Charles Brooks had dozens and dozens of ancestors migrating into Alabama in the early 1800s. Joseph Baxley born 1815 Georgia or possibly as some speculate, in SC., married Mary Evans and named a son James H. - the tombstone of James has the middle name as Hardie. James served in the Civil War and married Louisa Miranda Holt and resided in "Holtville". Their daughter Ella Olivia Baxley married L. W. Hood and had Bessie Mae Hood who married Milton Elijah Thornton. Elijah's parents were Mary Angeline Partridge, an indian, and George Thornton, a mixed blood from Georgia, who had settled in Central, Elmore County, Alabama. Elijah's daughter, Mary Ella Thornton married James Edgar Brooks Jr. Parents of James were Susie Mae Cooper and James E Brooks Sr. James and Susie are listed on the 1930 census with both their widowed mothers. Susie's ancestors were in Chambers County about 1830: Andrew Cooper and "Alsey" from SC living near Malinda Phillips and Elijah Lee born 1777 SC. Their children Sarah F. Lee married Charner P. Cooper, a soldier from the Civil War, and had a son named Levi who moved to Hope Hull working on a farm owned by Thomas Randolph Carter, where he fell in love with the daughter, Sarah Elizabeth Carter. Parents of Thomas were "Mary" and John Wise Carter of SC who had migrated to Talledega. Thomas is buried in Hope Hull on his old plantation by his first wife Lacy Jane Bozeman. Her name was Lucy on census but Lacy on her tombstone. Thomas served in the Civil War and his grandfather Captain John Carter served in the American Revolution, along with his own father in law, John Wise of South Carolina. The second wife of Thomas Carter was Mary Josephine Hereferd of Virginia and she was the mother of Sarah Elizabeth Carter. Mary was not very happy with this marriage and had only the one child. She buried Thomas by his first wife. Some of Mary's family settled in Alabama and some moved on to Texas. Mary's mother was Jemima Ramsey of Virginia. Parents of James Brooks were Annie Ballard and John Brooks of Tennesse and they are all buried at Greenwood Cemetery in Montgomery Alabama. John was a railroad man, born to Roxanna Permilia Smith of TN and a John Brooks born 1837 Pennsylvania. John 1837 died of tuberculosis in Texas. Parents of Roxanna were Caroline Bond and Thomas Smith. Parents of Annie Ballard were Dora Craig and James Ballard of TN. Some of these families migrated into Tennessee about 1800 from the Carolinas living amongst the Cherokee Indians and Chickasaw so they could have been mixed blood. Annie's picture shows she was a dark lady with black eyes and black hair and so was her husband's features very dark but I would suspect his from the Smith side of the family. Charles Brooks wed Kathy Cochran in Montgomery Alabama. She was at least one eighth Cherokee blood. Her parents were Anne Carter and Frank Cochran. Anne's parents were Alice Emily McClain and Cecil Earl Fenn Carter. Emily was called Emma,Ellie, and Emmer by her parents Lorena Bozeman and Charles McClain Lorena's parents were Alice Lorena Stephens and John Thomas Bozeman. Charlie's parents were Elizabeth Broadway and Josiah Marion McClain. The father of John Bozeman was Peter Edward Bozeman, a Civil War Soldier who married Nancy Jane Anderson, and her father was Seaborn Montgomery Anderson, another Civil War soldier. Seaborn had married Lavinia Jane Sellers. Cecil Carter's parents were Anna Lou Stone and William Franklin Fenn. Frank was born in Tuskegee to Emeline Harrell and John Fenn a Civil War soldier of Georgia. Anna's parents were Mary Ann Hendrick and Augustus Marvin Stone of Georgia. Anna divorced Frank Fenn about 1901/1902 and remarried to a Carter, then to a Dasher, as found in Georgia census records. Montgomery Alabama 1922 death certificate of William Franklin Fenn born 1855 in Tuskegee, Macon County Alabama, former Creek Indian Nation to Emeline Harrell and John Fenn of Georgia - John had served in the Civil War and moved his family to Alabama in the 1860s. Her daddy's brother born 1895 resided in Coosada, had a farm on Airport Road, a family cemetery and the Church Cemetery he donated, and later his land became Coosada Elementary School. Frank served in WWI and worked for the railroad and he was the father of Bob Fenn, the principal of Robinson Springs School around 1987. Frank's tombstone is next to his brother Robert's in their family graveplot. Robert never appeared on a census record but was known as Uncle Lee. Annie Carter was named after her grandmother Anna Lou Stone. Annie was Kathy's mother. Annie had open heart surgery in 1980 just weeks before Beverly was born but managed to walk into that hospital to hold her first grand daughter. Death Certificate - his daughter Alice married Cecil Earl Fenn Carter, the son of Anna Stone. Charlie raised the children of Alice and Cecil when they died by 1939. Charlie was the son of Elizabeth Broadway and Josiah Marion McClain. Census records show the date of birth of Charlie was 1886 and all other records seem to differ because his wife was not very educated. Annie Clark Ballard of Tennessee married John E Brooks and had one son named James. Mother of Milton Elijah Thornton in Elmore County Alabama and the granny of Mary Ella Thornton Brooks. Thomas R Carter buried near Lacy Jane Bozeman's monument but the top of his has fallen. He served in the Civil War and owned a plantation in Hope Hull. He buried her parents here in this cemetery. Cemetery located off I-65 Hope Hull Exit on the McLean Road in huge pasture on the right. Not sure who posted her as his mother on his death certificate. Lorena was the daughter of Alice Lorena Stephens and John Thomas Bozeman of the Dublin/ Ramer area in Montgomery County and she had indian blood. Daughter of Ethel Mae Bozeman's daughter Ruby Gibson - Minnie's daughter contacted me and sent the picture; please do write again. states he was born 1793 and a tree separates him from one of his wive's graves. He came from Darlington South Carolina with his father Peter who had served in the American Revolution and their many families to settle in Hope Hull in 1826. Jesse bought 160 acres in 1827 while his father wrote letters found at the Probate Office where he expected free land for his military service. Peter died in 1829 and is buried closeby one would expect - his grave is not yet found. Son of Peter and Nancy, married Alice Stephens, having Ethel Mae and Lorena Emma Bozeman, this photo may have been taken around 1890. John is buried at Hills Chapel Cemetery in front of the church at Dublin beside his brother Peter James, who died of suicide. Son of Martha Hill and William Henry Bozeman of Darlington SC who also settled in Hope Hull.....William was born about 1802 a son of Peter and brother of Jesse. Wm's son Peter Edward was married to Nancy Jane Anderson and he served in the Civil War and she got his pension - papers at Probate Office - Nancy had son named John Thomas Bozeman who married Alice Lorena Stephens. This tombstone is found in Dublin behind the Hills Chapel Church while his son John is buried in front of the church. Luella was the daughter of Lattie Little and Ben Coonfield born in Arkansas. This picture of Lattie shows her indian features quite nicely. Lattie Cedonia Little was born in Kentucky to Catherine Crigler and John Wright Little, who had served in the Civil War. Apparently she is now widowed and taking care of her mother - Cecil was in Fort Bliss in the Army. Luella was the daughter of Lattie Little and Ben Coonfield born in Arkansas. Lattie Cedonia Little was born in Kentucky to Catherine Crigler and John Wright Little, who had served in the Civil War. This picture of Lattie as a small child with her sister Sadonia and their mother Catherine Crigler of Kentucky. Catherine was the daughter of Catherine Roby and Abraham Crigler who were of Mixed Blood. John Wright Little military description, dark complexion, black eyes, black hair, served in the Civil War, made guns, was a blacksmith, born in Kentucky 1843 to Catherine Wright and Hiram L. Little. John's family refused Indian Land Allotment. Catherine Wright Little was the daughter of Catherine Weatherford and John Wright of Charlotte VA as they married there in 1811. Cains Chapel Cemetery at Slapout - father of Bessie Mae Hood Thornton. John Wright Little military description, dark complexion, black eyes, black hair, served in the Civil War, made guns, was a blacksmith, born in Kentucky 1843 to Catherine Wright and Hiram L. Little. John's family refused Indian Land Allotment. Catherine Wright Little was the daughter of Catherine Weatherford and John Wright of Charlotte VA as they married there in 1811. This picture of John as he got older and grey. John Wright Little's mother had a sister Martha who married Douglas Little, a brother of Hiram. Martha named her son Powhatan in honor of their indian blood. Powhatan was a writer, lawyer and a judge in Owensboro Kentucky History books. John Wright Little's mother had a sister Martha who married Douglas Little, a brother of Hiram. Martha named her son Powhatan in honor of their indian blood. Powhatan was a writer, lawyer and a judge in Owensboro Kentucky History books. This picture of Martha Wright is all we have of that lineage, lovely lady with indian features died of euthanasia according to old records of LP and his daughter Laura. Beverly photographs tombstones of her great great grandparents tombstones, Mary Angeline Partridge and George Thornton, the parent of Milton Elijah Thornton near Santuck, in Central at the Mount Hebron Primitive Baptist Church. Frank Cochran's granny was married to Jacob Cochran and named a son Frank Delbert Cochran. When Jacob died the widow made her rounds, spending a few months with each of her grown children's families. She smoked a pipe, read the ashes and taught them to pop corn. her ancestors of Ireland had settled in Rockinham Virginia where we find Rev. Alexander Miller of the 1700s buried at Cooks Creek Cemetery. Clora's mother was Mary Clara Parker of Ohio, who some say made medicine with the indians, born to Sara Tefft and Archelaus Parker of the New York Indian County. Tefft has a wonderful 1600s history in Rhode Island, where one of the Uncles was hanged by King Phillip. Charles was the son of Mary Ella Thornton and James Edgar Brooks Jr - Parents of Mary Ella were Bessie Mae Hood and Milton Elijah Thornton. Parents of James were Susie Mae Cooper and James E. Brooks. Widow of Peter Edward Bozeman, is buried by two of her sons in this family plot, not far from the Brooks and Coopers and Fenns who are also buried at Greenwood Cemetery in Montgomery Alabama. Levi Cooper married Sarah Elizabeth Carter and had Susie Mae. Levi's father Charner Cooper had served in the Civil War and married Sarah Lee of Chambers County Alabama. Levi Cooper married Sarah Elizabeth Carter and had Susie Mae. Levi's father Charner Cooper had served in the Civil War and married Sarah Lee of Chambers County Alabama. This picture of Susie Mae with her spouse James E. Brooks. Son of Clora Jane Miller and Jacob Benjamin Cochran served in WWI while Jacob was a Civil War soldier of the Ohio Infantry. Levi Cooper married Sarah Elizabeth Carter and had Susie Mae. Sarah was the daughter of Mary Josephine Hereford of Virginia and Thomas Randolph Carter of SC who had settled in Hope Hull. Son of Alice McClain and Cecil Earl Fenn Carter was the father of Victoria Carter, all buried at Memorial Cemetery except Vickie who was cremated by her half sisters. Mary Josephine Herriferd married T R Carter and had Sarah Elizabeth Carter. Son of Alice McClain and Cecil Earl Fenn Carter he was the brother of Anne and Cecil Jr. Alice died giving birth to "Billy". Billy spent most of his life in Indian Territory Oklahoma. Pictures taken by Billy Carter, Anne's brother, accompanied by Lillian, Billy's first wife and he did have several wives but no children. grandfather of Lorena Emma Bozeman McClain and he was the great great great grandfather of Kathy. Beverly took me to Dublin to locate these tombstones - grandfather of Lorena Emma Bozeman McClain and he was the great great great grandfather of Kathy. Beverly took me to Hope Hull to locate these tombstones - plus we found the grave of T R Carter, a great great grandfather to Charlie Brooks. Carter's daughter Sarah married Levi Cooper, the son of Charner Cooper. Nancy Jane Anderson married Peter Edward Bozeman in Dublin and they had John Thomas Bozeman who fathered Lorena. Father of Thomas Randolph Carter came from South Carolina to Alabama. Mordecai served in the American Revolution with sons Peter and John. Peter moved to Alabama about 1826 while John moved to Mississippi in 1823. James remained in Darlington County SC. Mordecai Bozeman served in the American Revolution = father of Peter Bozeman who migrated to Hope Hull who also served along with him in the War - they were paid for their services and received land grants in Darlington County South Carolina. Josiah Marion McClain was born in Georgia to Anna and James McClain. Josiah married first to Julia King and had a family in Georgia, then he joined the Civil War in an Alabama Infantry and was with Elizabeth Broadway by 1870 having a son named Charles Allen McClain. Charles and his wife Lorena had a daughter named Alice McClain who married Cecil Carter. grandfather of Susie Mae "Mamaw" Cooper Brooks - Charner served in the Civil War and married Sarah F Lee of Chambers County. yet not in my direct line. runs strong in our family. with their recipes, hobbies and customs. In Arizona many spoke spanish; I remember a huge Catholic church where we all went for vaccinations but best of all were the outdoor festivals held there. Much love and appreciation to my wonderful aunts and cousins working on this line. One of my new online cousins turned out to be my best friend from high school and our paths crossed as we both researched our grannies; such fond memories of a truly wonderful friend, Linda McClanahan of Forest Hills. with his mother in Montgomery Alabama She was our great great granny Nancy Jane Anderson Bozeman, widow of Peter Edward Bozeman. Beverly took me to Coosa River Primitive Baptist Church Cemetery, about 3 miles from Holtville School and another mile from the Cains Chapel Church Cemetery where other relatives are buried. James was the father of Ella Olivia Baxley Hood and he was the great great great grandfather of Charlie Brooks. father of Josiah Marion McClain with second wife and children so this migration might be the reason our great great grandfather Josiah came to Alabama and he joined the Civil War at Greenville and never went back home to his first wife. on Hull Street , Sami's great grandfather James E Brooks family and his father in law. refers to Archibald Clark and Isaac Coonfield who was married to Barsheba Clark. grandma Anna Stone sent his picture to the family so he must be the son of her brother Arthur Augustus Stone. Tige played in 1923 for the St Louis Cardinals before moving on to Florida where he is buried.l He also attended Mercer University in Georgia and played baseball there before moving on. tombstone of Alice Lorena Stephens Bozeman, wife of John Thomas Bozeman in Dublin AL Quite an emotional event when her grave was discovered in 2007 - the mixed indian grandmother we had heard of is buried in a long lost cemetery in Dublin behind old Hills Chapel Church deep within the woods. W F Fenn headstone Cecil's father. Great great grandfather to Nancy Jane Anderson Bozeman - Nancy Jane was Lorena's grandmother who took them in when Alice Stephens died. Elisha's Will would be one of the first few filed in Montgomery County in the 1830s. Estate Sale names many of our other ancestors who attended. Father always called Mother his little Indian Squaw and she loved it. They were a very proud Indian couple yet never knew the language or customs known to those on Indian Reservations. Our families grew up with grandparents who had a tonic or poltice for their ailments and grew their crops to feed their families - mother nature took good care of them. They traveled our great nation seeking answers that were never found. We lived among other Indian families...Mother was Cherokee, possibly half blood; Father was both Cherokee and another tribe, possibly Creek, or Shawnee, since his mom stated they were from two different tribes. and Cherokee or was it his wife who had Indian Blood? We have so much work to do ! The census records are all black and white, Indians were mostly put down as colored. Even the 1850 census records show race only as B W or C. Indians lost their lands and they lost their rights to be treated humanely. Some were dragged from their homes and forced to move to Oklahoma Indian Territory and many did not survive the trip...Perhaps my ancestors died on the Trail of Tears, yet they might have hidden until it was safe to come out and claim to be white, so they would be treated as equals. Those who hid might have become the Over Hill Cherokee Tribe. Others moved into Kentucky or Tennessee, intermarried, learned a trade or fought in the Civil War. They took on famous white names so nobody would suspect they were Indian.Ohio, Kentucky, Indiana, Missouri, Illinois and even Texas and Arkansas became a safe haven to many tribes...Of course Kentucky became a state after actually being a part of Virginia; Tennessee was actually a part of North Carolina. We have the locations and the time periods yet we have no documentation to prove our Indian Blood. The Indians became invisible. They had no choice! One ancestor suffered a house fire that destroyed any documents and photos that might connect to our past. He was Annie Stone Fenn's oldest son. We are finding more connections to Virginia, North Carolina and South Carolina before the Trail of Tears began and know that many were intermarried with these tribes, before they moved into Georgia or Kentucky and onward.Some came out of New York Indian Country, Rhode Island and Massachusetts, removing to Ohio and on westward mingling with other tribes, and starting a new life. My John Wright Little left Kentucky and claimed to be white when he got to Arkansas so that he could find good work and own land. His line goes to Charles Weatherford of Virginia which could be the same father of Chief Red Eagle. Great Grandpa Charlie McClain had many visions of his elders, but of course some thought he was simply crazy. His wife, Lorena Bozeman was a healer and could stop bleeding, people still remember her faithful help in Ramer...Anne Carter also had her visions and her husband Frank Cochran had amazing premonitions, not simply intuition, but the true feeling of happenings in the family, that led him home in urgency. His sister was born with a veil over her face which the doctor removed twice and it still came back ! The third time, her mother, Luella Coonfield Cochran, took the veil and placed it in the family Bible that once belonged to her mother Lattie and it still remains. The veil is usually a gift to a seer. In my dreams, I heard mother's voice saying Sleepy Cloud and I am still trying to learn what she meant. son of Peter Edward Bozeman - Lorena's Uncle. Hiram Little at the Alamo but which one is he? Many of our ancestors have at some point in their journeys, spent time residing in Alabama. They crossed the Atlantic and ventured south for many reasons and on through the midwest. Many of them married young Native Americans and that is one fact which is very difficult to prove since it was rarely ever acknowledged on census records. Then the census officials often could not spell names correctly! Everyone was black or white in the 1800s and mostly whites were allowed to purchase our land and profit from it. Now we have to prove a direct blood line to our Indian families or the government will not recognize us as Native Americans. Can you find any other race asked to prove themselves? If you take a moment to think about it, we ALL probably have Indian blood in our family tree. It's no big deal and nothing to hide, but certainly something we can be very proud of because the Indian were a very proud people who cherished this country and all their Creator provided within it. They prayed daily to the Creator and had high respect for everyone in their peaceful land. for the true answer to our past. Listen to the stories of your Elders and look around for clues. of cousins. Each day we find a new story to share and possibly a shocking fact! Many of the branches in my family tree lead to another Indian Chief and I am still looking for the Indian Princess in my direct blood line. Our Little family has been researching a link to the sister of Pocahontas, named Cleopatra, while some researchers say there is no documentation proving she ever existed, they cannot prove she didn't. One great grandmother married at the age of 12 and had six children by the age of 19, according to the census records but I do believe they have her age posted incorrectly. I am still anxious to know about her life, but she vanished about 1900 and hopefully to a better life! Her family may have been laborers on the Fenn Plantation in Eufaula, and we certainly read where Indians worked the farm. They shared every day together and intermarried. Some of the slaves on that plantation adopted the last name of FENN. hide whenever the KKK came down the road. Her uncle was told to sit in the back of the bus during the days of prejudice. Now I search for the answers Mom was seeking - who gave her this Cherokee heritage. Names I am now searching are: Clora Jane Miller Cochran, Lottie Sadonia Little, Luella Coonfield, Peter Edward Bozeman (Bosman), Josiah Marion McClain (McLain), Annie Lee Stone Fenn Carter, William Frank Fenn, Cecil Earl Carter, John Fann and Emeline Harrel, Nancy Jane Anderson, Sara Mills with Joseph Stephens, Mordicai Bozeman of 1700, Martha Young Coonfield, Mary Epperson Coonfield, Barsheba Clark Coonfield, and several Moons as well. We all connect thru our old ones and find we are all cousins! Charlie McClain weds Emma Lorena Bozeman 1901 in Ramer? Cecil Earl Carter born in Thompson AL ABT 1904? Fenn father? The stories consist of one great granny, Lorena, who was a well known healer in Dublin, Alabama; one who could read the ashes after smoking her pipe; one aunt born with a veil over her face ( which was removed three times) which was the sign of a seer. The amazing intuition of my father, who left work immediately when it thundered, knowing that his baby was about to be born, and yes, I was born that day, in Broken Arrow, Tulsa, Oklahoma. Seaborne Anderson in Alabama - Seaborn Montgomery Anderson was the father or Nancy Jane Anderson Bozeman. Carrie Fenn Johnson sister to Cecil Earl Fenn Carter so she is our Aunt and she died in Indian Nation Oklahoma about 1935. Their brother Frank Fenn of Coosada called these two people his "half" siblings, but he himself looked indian. Texas - new family, 6 new children plus two more from Kentucky - Brooks family nearby - Hiram's baby is named Brooks. 1830 census image NOTE Captain John Stone's District !! Thomas Stone signed the Declaration of Independence...kin??? James Edgar BROOKS was born 13 DEC 1895, and died 19 APR 1965. He was buried in Greenwood Cem., Molntgomery, AL. He was the son of 2. John Edward BROOKS and 3. Annie Clark Ballard. He married Susie Mae Cooper 10 MAR 1923 in Montgomery, AL. She was born DEC 1902, and died 12 FEB 1977. She was buried in Greenwood Cem., Montgomery, AL. 2. John Edward BROOKS was born 5 JUN 1872, and died 5 OCT 1929. He was buried in Greenwood Cem, Montgomery, AL. He was the son of 4. John Brooks and 5. Roxanna Permelia SMITH. 3. Annie Clark Ballard was born 2 OCT 1877 in Maury Co., TN, and died 1 OCT 1963. She was buried in Greenwood Cem., Montgomery. Child of Annie Clark Ballard and John Edward BROOKS is:1. i. James Edgar BROOKS was born 13 DEC 1895, and died 19 APR 1965. He married Susie Mae Cooper 10 MAR 1923 in Montgomery, AL. She was born DEC 1902, and died 12 FEB 1977. 4. John Brooks was born ABT 1837 in PENN, and died 1882; his father from Holland and mother from France. 5. Roxanna Permelia SMITH was born 25 JAN 1841, and died 19 JAN 1925. She was buried in Arlington Cem., Mt. Pleasant. She was the daughter of 10. Thomas S. SMITH and 11. Caroline M. Bond. Children of Roxanna Permelia SMITH and John Brooks are: i. Nora Caroline BROOKS was born 14 DEC 1861, and died 1937.
ii. Walter Henry BROOKS was born 21 MAY 1866, and died 1953. He married Lena Gray ABT 1892 in Decatur, AL ?. She was born JAN 1874.
iii. M.B. BROOKS was born JUL 1870. 2. iv. John Edward BROOKS was born 5 JUN 1872, and died 5 OCT 1929. He married Annie Clark Ballard 12 DEC 1894. She was born 2 OCT 1877 in Maury Co., TN, and died 1 OCT 1963.
v. Lula Christine BROOKS was born 4 NOV 1874, and died 24 JAN 1971. She married Edmond Lee Wiltshire. He was born 23 DEC 1868 in TN?, and died 5 MAR 1927.
vi. Nimrod William BROOKS was born 25 APR 1877, and died 30 MAR 1962. He married Mattie Josephine Rollins JUL 1907 in Montgomery, AL. She was born 1886, and died 15 NOV 1975.
vii. Thomas Smith BROOKS was born 13 JUN 1882, and died 16 MAR 1907. 10. Thomas S. SMITH was born 20 SEP 1820, and died ABT 1890. He was the son of 20. Henry SMITH and 21. Sinia (Sina) Evans. Children of Caroline M. Bond and Thomas S. SMITH are:5. i. Roxanna Permelia SMITH was born 25 JAN 1841, and died 19 JAN 1925. She married John Brooks 26 FEB 1861 in Maury Co., TN. He was born ABT 1837 in Holland, and died 1882. She married Terry (Dr.) Crittendon Smith APR 1882 in Maury Co., TN. He died 28 NOV 1928.
ii. John Henry SMITH was born 21 DEC 1844. 20. Henry SMITH was born 24 MAR 1791, and died 3 SEP 1843 in nr. Mt. Pleasant, TN. He was buried in Hunter's Cem. He was the son of 40. Thomas SMITH and 41. Elizabeth Haynes. Children of Sinia (Sina) Evans and Henry SMITH are:10. i. Thomas S. SMITH was born 20 SEP 1820, and died ABT 1890. He married Caroline M. Bond 31 DEC 1840 in Maury Co., TN. ii. Robert SMITH was born 18 NOV 1822, and died 1888. He married Mary Williams ABT 1845 in Madison Co., MS. She was born ABT 1825.
iii. girl ? was born ABT 1830. 40. Thomas SMITH was born 7 AUG 1732/61 in Goochland Co., VA, and died ABT 1814 in Bedford Co., VA. He was the son of 80. JOHN Col. SMITH and 81. SUSANNA RANSON. 41. Elizabeth Haynes was born ABT 1769. Children of Elizabeth Haynes and Thomas SMITH are:20. i. Henry SMITH was born 24 MAR 1791, and died 3 SEP 1843 in nr. Mt. Pleasant, TN. He married Sinia (Sina) Evans ABT 1819 in Maury Co., TN. ii. John H. SMITH was born ABT 1793.
iii. Susanna SMITH was born ABT 1799. She married Thoms Leftwich 1822 in Bedford Co., VA.
iv. Francis SMITH was born ABT 1801.
with Susie Mae Cooper as wife plus both of their mothers are living with them. He works for the State as a bookkeeper. On Adams Street in Montgomery Alabama with no children in household on this census record. Tom Carter's father was John Wise Carter of South Carolina and nothing is known of his mother. John's father, Captain John Carter, served in the American Revolution with a John Wise. The daughter of John Wise was Elizabeth and she married Captain John Carter in South Carolina. Captain John may have had a brother named Captain Thomas, explaining how he named his own son Thomas Carter. It is unknown why Tom left his family in Talladega and moved into Montgomery. He was buying land off the Bozeman Estate to make a home for his own family. Tom lost his first wife and several children in the small pox epidemic, some say the flu epidemic. Only two children survived, Lucy Carter Calloway and William Henry Carter. Military records indicate that Tom was sick in a Virginia hospital at one point and ironically married his second wife, Mary, from Virginia. Perhaps they had met in Virginia and she followed him, their story is unknown. Mary had only one child, Sarah, and wanted no more with Tom. When he died she buried him by his first family and she moved in with her daughter. Mary may or may not have filed for his military pension, thus far, a record is not found. Remarks: Sick at Gen Hospital, Lynchburg, Va, Dec 7, 1861. John Carter in Talladega AL - counties are still being formed out of St Clair County so he probably did not move at all - the county line was moved. Cash receipt for portion of William Henry Bozeman's estate, that was left to his son. Could there be a connection way up the line? Our Great Grandmother married three times. Two of her children Carrie and Cecil Earl were called "half" siblings by the other children, but they were all born while Anna was with Fenn....go figure. Anna Lou's baby was named Cecil Earl and he is only found in Texas census records for 1920 and 1930 during his military service first at San Antonio and then at Fort Bliss in El Paso. On the 1900 census Anna's son Robert is not listed so she may have been pregnant at the time and she may have also raised him but I have been unable to locate her on a census after she married or lived with Mr. Carter - she was very young and may have had more children with Carter. There are some possibilites with the census records but the woman is listed as black and widowed - then there is one Arnie Carter which could be Annie in Macon GA and she is alone, a laundress. Even so, in 1910 and 1920 there is no Robert listed as her son and the family knew him personally and he did exist and I found his tombstone by his brother Frank Jr. Then her son Arthur is not found after 1910 even though family says he married, had children, and died in his 20s.